I grew up believing work was what you did to earn money, so that you could pay for the things you enjoy, but they had to fit around the edges of your work.That was a pretty limiting belief system. And really not very much fun. No wonder I had a whole string of jobs that I basically hated, but felt tied to.When it came to me starting my own business, that belief almost made me quit before I’d even started. Because I believed that in order to succeed as an entrepreneur, I had to hustle, and not sleep, and work in all my spare moments - because that fit my old model, and it was I saw so many other people doing. But I really really didn’t want to be that person, in order to run that business.Luckily, I had a perspective-shifting conversation with a coach that inspired me to see the world of work differently. After this conversation, I determined to build a business that supported the life I wanted - and did not detract from or crowd it. 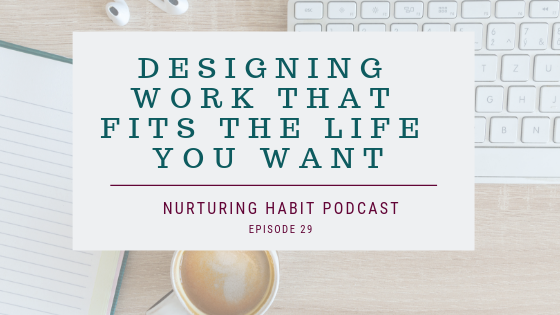 I now have that business, and it works.And you can do it, too.In this first episode of Season 3, where I’ll be talking about how we nurture the work we do in the world, I’m talking about a whole new way of structuring a life and a business, and braiding the two of them together. Whether you are just starting a business or have an established company that just isn’t working quite right for the rest of your life, I’m sure you’ll find some new ideas in this discussion.Listen to Episode 22 now in the play bar below (reload your browser if you don’t see it). Or open the episode in iTunes. This show is also available in Google Play and in Stitcher.